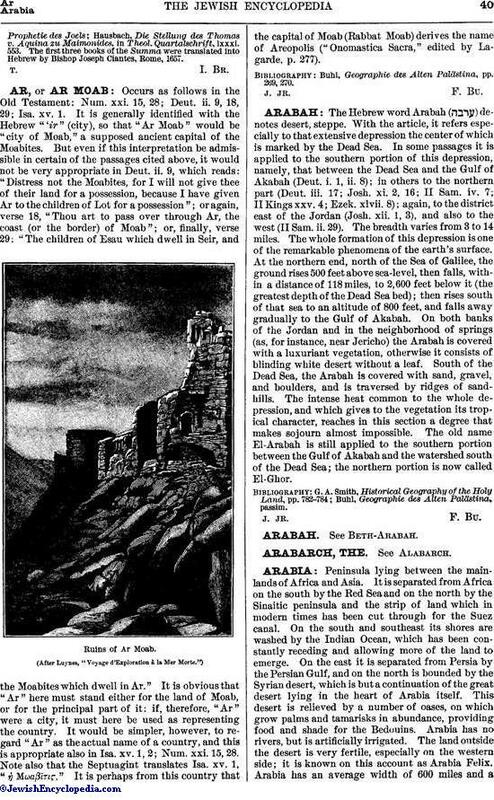 The Hebrew word Arabah ( ) denotes desert, steppe. With the article, it refers especially to that extensive depression the center of which is marked by the Dead Sea. In some passages it is applied to the southern portion of this depression, namely, that between the Dead Sea and the Gulf of' Akabah (Deut. i. 1, ii. 8); in others to the northern part (Deut. iii. 17; Josh. xi. 2, 16; II Sam. iv. 7; II Kings xxv. 4; Ezek. xlvii. 8); again, to the district east of the Jordan (Josh. xii. 1, 3), and also to the west (II Sam. ii. 29). The breadth varies from 3 to 14 miles. The whole formation of this depression is one of the remarkable phenomena of the earth's surface. At the northern end, north of the Sea of Galilee, the ground rises 500 feet above sea-level, then falls, within a distance of 118 miles, to 2,600 feet below it (the greatest depth of the Dead Sea bed); then rises south of that sea to an altitude of 800 feet, and falls away gradually to the Gulf of Akabah. On both banks of the Jordan and in the neighborhood of springs (as, for instance, near Jericho) the Arabah is covered with a luxuriant vegetation, otherwise it consists of blinding white desert without a leaf. South of the Dead Sea, the Arabah is covered with sand, gravel and boulders, and is traversed by ridges of sandhills. The intense heat common to the whole depression, and which gives to the vegetation its tropical character, reaches in this section a degree that makes sojourn almost impossible. The old name El-Arabah is still applied to the southern portion between the Gulf of Akabah and the watershed south of the Dead Sea; the northern portion is now called El-Ghor. Buhl, Geographie des Alten Palästina, passim.